The Caesar Rodney Chapter was organized at the home of Mrs. Sallie Tennent Turner on December 7, 1895. It was the first chapter in the State of Delaware. The chapter was named for Caesar Rodney, who was a signer of the Declaration of Independence and a brigadier general of the militia. Charter members were: Miss Sophie Waples, Mrs. Sallie Tennent Turner, Mrs. Elizabeth Clark Churchman, Mrs. Claudia Marshall Chesley, Mrs. Elizabeth Washington Cardeza, Miss Katherine Cobb, Mrs. Caroline Cloak Dennison, Mrs. Kate A. Duncan, Mrs. Louise Furbee, Miss Harriet W. Mahon, Miss Ella Turner, and Mrs. Katherine Arndt Graff. Miss Sophie Waples was elected our first chapter regent. Mrs. Elizabeth Clark Churchman became the first Delaware State Regent; and she, with the assistance of members of the Caesar Rodney Chapter, soon organized other chapters throughout Delaware. The Caesar Rodney Chapter has donated time and contributed money towards countless patriotic, historic, and educational endeavors over the years. We have always been very active in veterans causes, and participated actively and financially throughout the two world wars. In the early to mid-1900s, most of the money that we donated was raised by hosting garden parties or card parties. In more recent years, our financial donations came directly from members’ dues. Below is listed some of the highlights of our efforts over the years. Contributed towards the purchase of a “Stand of Colors” for the Battleship Delaware, and also contributed to the silver service presented to the battleship by the State of Delaware. Raised money to purchase our own United States flag, our own National DAR flag, and contributed toward the purchase of a Delaware State flag for Memorial Continental Hall. Contributed funds to complete the Clark Churchman Memorial Scholarship at Delaware State College and towards a state flag for the college. Contributed to the Caesar Rodney Equestrian Statue Fund and towards the restoration of the old town hall. Gave generously for the building of Continental Memorial Hall. The Delaware Room, in the hall, was a gift of two chapter members, Miss Harriet Mahon and Mrs. Louise Furbee, in memory of their sister Mrs. Caroline C. Dennison. Our chapter provided the room with its first carpet; and, they also gave the antique desk and iron grille for the door. Mrs. George C. Hall presented a corner cupboard, which has been replaced by an old colonial cupboard. Mrs. Eugene DuPont gave the davenport. Purchased four feet of the ground upon which Constitution Hall is built. Contributed towards the purchase of the Delaware Box in Constitution Hall and gave generously towards the reduction of the debt fund. Several members purchased memorial chairs in the auditorium. Contributed to the planting of the DAR garden on the DuPont Highway near Dover. Sponsored the organization of the C.A.R. Society in Delaware. Established the Junior Society of the Caesar Rodney Chapter, which then developed into an active and valuable group contributing to the senior chapter in all its projects. The Juniors contributed generously to the Seeing Eye Dog Fund and the Berman Metal Locator. Presented 1500 large placards of the Flag Code to all the public schools in Delaware on behalf of the Blue Hen Chickens. Garden parties held at the home of Mrs. Walter S. Williams in 1940 and 1941 raised money which was used partly to buy DAR lineage books for the state archives in Dover with the remainder contributed to the Priscilla Williams Student Loan Fund. Conceived of and sponsored the idea of purchasing an ambulance to be used by Delaware State College for war work. Adopted little Juliette, a Belgian war orphan, paying monies to help care for her for several years. Contributed money for the restoration of the French village of Tilloloy and to the DAR Liberty Loan Fund. Purchased war bonds and donated to the Red Cross and the United Service Organization USO (for pantry supplies). Gave a generous donation to the National Society’s Blood Plasma Fund. Assisted in the purchase of a portable x-ray unit for the U. S. Navy. Sent two large Christmas boxes and a victrola with records to the U. S. S., Landing Craft Infantry (Large) 593, the navy ship sponsored by the Delaware State DAR Committees. Served several Sunday breakfasts and evening refreshments for the USO. Contributed towards the DAR schools and approved schools, the Red Cross, Ellis Island, the DAR Library, and the Student Loan Fund. Donated towards the preservation of historic places and records including contributions towards the Bell Tower at Valley Forge. Purchased one of the three stones which had been set aside at Valley Forge for three Delaware signers of the Declaration of Independence. 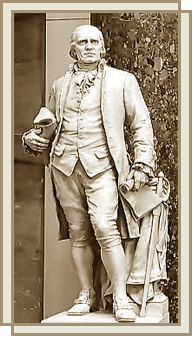 On it was inscribed Caesar Rodney’s name and dates with the chapter’s name and date of presentation. Aided in the Delaware Antique Show project; the proceeds helped in the restoration of the John Dickinson Mansion at Dover. Helped in the state project of refurnishing the Delaware Room in Continental Hall in Washington. Gave annual presentations of history prizes to our local high schools. Distributed immigrant manuals to new United States citizens. Our regents extended greetings to the new citizens in the federal building, presenting an American flag to each one and often hosting a luncheon reception for them. Presented a number of books and pamphlets on Delaware history to the DAR Library. Furnished the second floor of the Old Academy in Brandywine Village and acquired it as our headquarters. Our members also acted as guides on the first floor, which was furnished as an 18th century school room and was open as a museum by appointment. 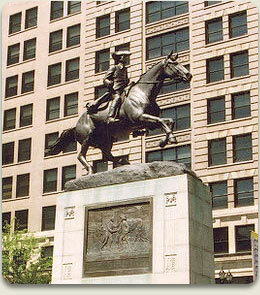 Supported the repair and reconditioning process of the Caesar Rodney Equestrian Statue in Rodney Square in 1996. We continue to support patriotism, education, historic preservation, and our veterans up to the present day. Every year, we take part in the Veterans Carnival at the Wilmington VA Medical Center in Elsmere, Delaware; and, we give bags containing various sundries and a handwritten thank you note to all the veterans. We continue to regularly contribute to the DAR schools and the DAR Library. We regularly contribute funds to Stockings for Soldiers community project, the Wounded Warrior Project, and support various other veterans causes. 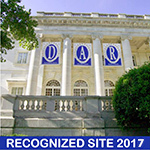 Carolyn W. Burlew, Executive Director of the Stone School and chapter regent (2010-2013); and, we received a National DAR Community Service Award for her work on the restoration of the Stone School on October 15, 2005, at a Delaware NSDAR State Meeting. At Christmas, members serve as guides at Lombardy Hall, the country estate of Gunning Bedford, Jr., who was a Delaware delegate in 1787 to the Constitutional Convention in Philadelphia, Pennsylvania. We decorate the house for Christmas in the 18th century manner for an open house which is usually held the first weekend in December. In 2011, after extensive research, our chapter filed the required paperwork to bestow the DAR Medal for historic preservation to Mr. Harold Thomas Jackson Littleton for his work in preserving Lombardy Hall for future generations. This prestigious medal honoring his commitment to historic preservation was presented to him in December 2011, by the Delaware State Regent, Marjorie Frampton, during the annual Lombardy Hall open house.